Are you paid what you are worth? What is the relationship between the actual work you do and the remuneration you receive? The revelation that London dog walkers are paid considerably higher (£32,356) than the national wage average (£22,044) tells us much about how employment functions today. 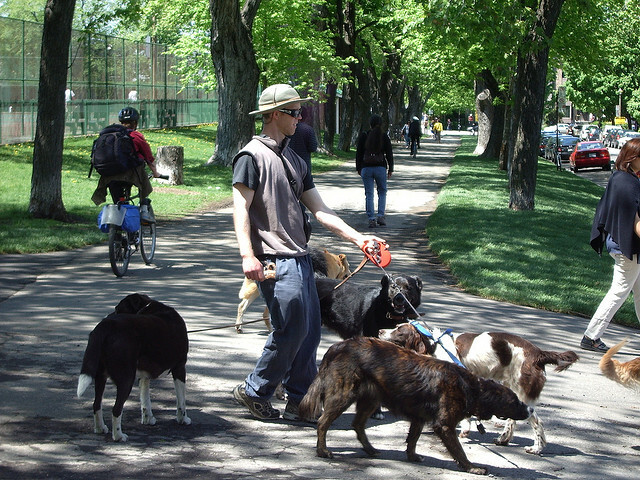 Not only are dog walkers paid more, but they work only half the hours of the average employee. It is clear that the relationship between jobs and pay is now governed by a new principle. The old days in which your pay was linked to the number of hours you clocked up, the skill required and the societal worth of the job are long over. Other factors play a bigger role in determining how much you are rewarded today. This is why we live in a world where the task of walking a millionaire’s dog through Hyde Park is considered more valuable than an NHS nurse (starting salary £21k). We are surrounded by examples of this increasing disparity between jobs and pay. For example, average wages in western countries have stagnated since the 1980s, with little movement as living costs have soared and public utilities been privatised, which almost always increases the cost to users. Labour productivity and growth during the same period has steadily increased too until very recently, leaving wages far behind. If we really want to understand why productivity has recently stalled in the UK, then wage stagnation must be part of the answer. If someone asked you to work harder with the hours at your disposal, and you had not received a pay increase in 20 years, would you happily reply, “Sure”? More likely you would nod obligingly and then fake as much of the extra work as possible, behaviour recently observed in a US study. And then there are the gargantuan and completely disproportionate salaries awarded to business executives and senior public servants. What determines these eye-watering figures? It cannot reflect increased effort because no one can raise their productivity levels by that much. Neither can these huge salaries be put down to market scarcity of skilled individuals. It’s not as if the pool of able executives suddenly dried up in the last 10 years. And it cannot be linked to company performance given the 2008 financial crisis. Yet executive pay has trebled over the last few years despite the double-dip recession and the banking crisis. Something else must be going on, more related to the privilege and power around the job than the actual job itself. Executive salaries stand in stark contrast to what has been happening to everybody else. Why is there now such a gulf between the work we do and the pay we receive? Unemployment isn’t a natural state of affairs, but closely managed to keep wages low. It has been very useful for deterring the kinds of wage increases that once made employment relatively worthwhile instead of a one-way ticket to hardship as it is today. Moreover, we have seen an explosion of “crap jobs”, especially in the service sector, which are often stressful, relatively difficult to do well and unduly low paid. Emerging out of this rather bleak employment situation is a new type of work ethic. It is defined by one’s willingness to sacrifice everything for work. A person’s worth is no longer defined by their positive contribution to society but their readiness to abandon all vestiges of self-preservation in order to be counted as “gainfully employed”. The message is clear: simply be grateful you have a job and accept whatever sum is offered. Hence the trend of moving the costs of employment on to the individual, which frequently exceeds their income, accounting for the horrendous levels of personal debt currently plaguing more and more workers. Many people are actually paying to work rather than working to be paid. This weird ethic of sacrifice is evident at both the bottom and top of the occupational hierarchy. In the banking sector, for example, we see some employees making the ultimate sacrifice. Dropping dead from overwork orleaping from the top of high buildings. And then we have the working poor who expend all of their income simply to work, including an expensive commute, childcare and so forth. But the ultimate expression of the sacrificial ethos is the intern. They work for free. So rather than income accurately reflecting effort, performance or social value, it is probably more dependent on where you are located on a rather steep employment hierarchy, which increasingly appears to be determined by the wealth you already have. At the apex of this hierarchy are senior executives and public officials, selected from the same group of elite schools and families. These individuals receive so much money that they do not really need to work. They could easily join the ultra-small group of unearned income holders, the rentiers and idle rich that control good parts of Britain, the US and the global south. Then you have the second tier of employees who hold very well-paid jobs that service the rich. The third tier consists of the 99%-ers and they make up the rest of the hierarchy. So many of us are in this category that it has developed its own hierarchy of “good jobs” and “bad jobs”. Some of these are crucial to society: midwives, street cleaners, postal workers, health inspectors. Others are “crap jobs” that have proliferated in the service sector, but are still considered infinitely preferable to entering into the government-run hell called the unemployment industry. Jobs that are most necessary for the public good are often the least economically recognised. And vice versa. Given some of the pointless but overpaid jobs, perhaps dog walkers are underpaid after all. Peter Fleming is Professor of Business and Society, Cass Business School, City University of London. The article originally ran on The Guardian and is reposted here with permission of the author.